Nike continue their countdown of the most iconic Mercurial colourways to make an impression on football’s biggest stage ahead of the reveal of the Mercurial Vapor X with the ‘Fast Forward’ edition colourways. This time it’s the turn of the Yellow/Green colourway made famous on Ronaldo’s Vapor III’s from 2006 to take the stage on the' Nike Mercurial Vapor IX – Fast Forward ’06. Featuring the first carbon fibre heel-counter and a new high-visibility color, the 2006 Mercurial Vapor III was built for speed and comfort. The 2014 Mercurial Vapor IX Fast Forward '06 provides today’s players with modern boot technology inspired by visual elements of the 2006 classic. The distinctive ‘Spray’ from the heel of the boot is recaptured with bright green over canary yellow/gold, and the bold black Nike branding recalls the black Swoosh and ‘R9’ insignias that characterised the Vapor III. 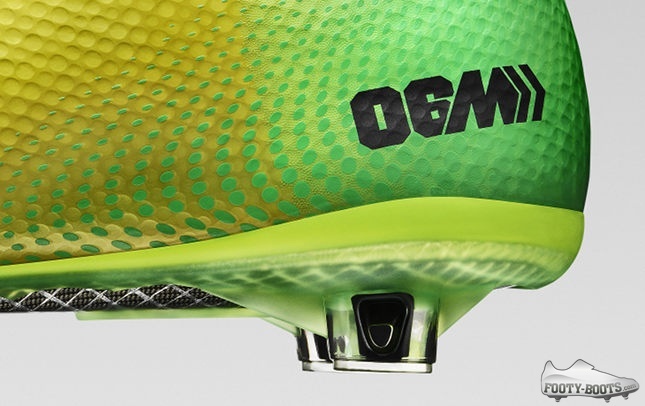 One neat touch on the Nike Mercurial Vapor IX – Fast Forward ’06' is the darker heel studs; again something which long-time Vapor wearers will recall with fondness. The Chtome tongue and ‘fact sheet’ on the sockliner also mark this out as the penultimate Fast Forward Mercurial before we get the Vapor X. Colour us excited. 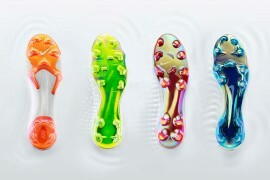 Other than that, players who will wear these football boots will have all the modern trappings. A dual-density glass fibre soleplate provides responsive traction and superb energy return, whilst an ACC-imbued ' Speed Control Texture upper allows a consistently great feel for the ball. 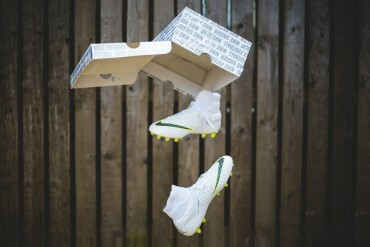 A favourite of many Mercurial die-hards, will you be picking up a pair of the Nike Mercurial Vapor IX – Fast Forward ’06? my fav colorway of the vapor 3s, which i wasnt able to get back then. these will be mine!